P.S. I'm using AudioLabel 4.40 & Win XP. The Canon Pixma Pro 9000 is one of those interesting printers that has the Direct Disc Printing feature enabled if sold in Europe, but disabled if sold in North America. The Europe version of the Canon Pixma Pro 9000 includes the plastic disc tray (Tray Type E) for loading inkjet printable discs. The Canon Europe website lists the Pro 9000 as having a CD-R / DVD tray in the specifications, but the tray is missing from the U.S listing (see the below links). The reason the Direct Disc Printing feature was disabled in North America was due to patent issues with the Epson Corporation (one of Canon's strong competitors in the printer market). However, Canon has recently started selling a new line of printers in North America that have the Direct Disc Printing feature enabled. My direct disc feature isn't enabled. 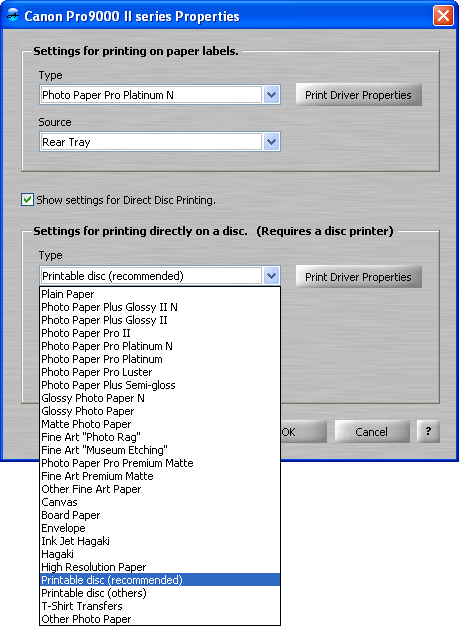 In print Properties under direct disc printing, "Printable disc" isn't listed in the type drop down list and "cd-r tray E" is missing from the the size drop down list. I tried the "instructions for activating my printer. That failed to...Now where do I go???? I other thing....this is the Pro 9000 "Mark II"
I installed the Canon Pixma Pro9000 Mark II print driver (version 2.70 - 10/11/13) on Windows XP and took the below screenshot. **Please note that the Printable disc (recommended) option is at the bottom of the list (not alphabetical). The CD-R Tray E option is also at the bottom of the list. 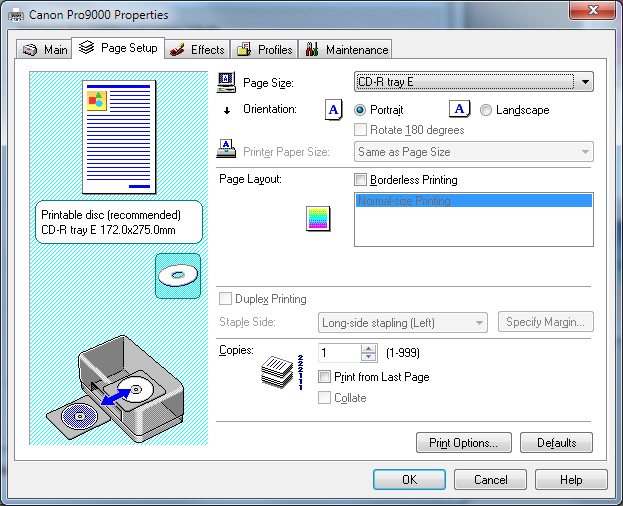 Furthermore, please make sure you have selected the Canon Pro9000 II series printer in the Print Dialog (otherwise you will see options for a different print driver). When you loaded V2.70 what region did you choose US or Europe and Asia? 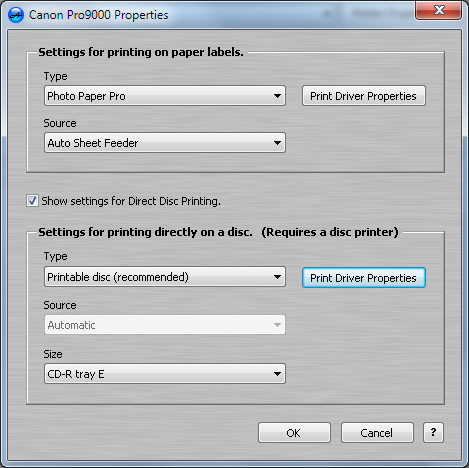 I dont believe US V2.70 for the Canon 9000 MKII supports printing to discs. I installed the latest driver and direct disc printing is not supported. Unless you have a European version of the printer it does not work. When installing the Canon Pro 9000 Version 2.70 print driver, I had selected US as the region. 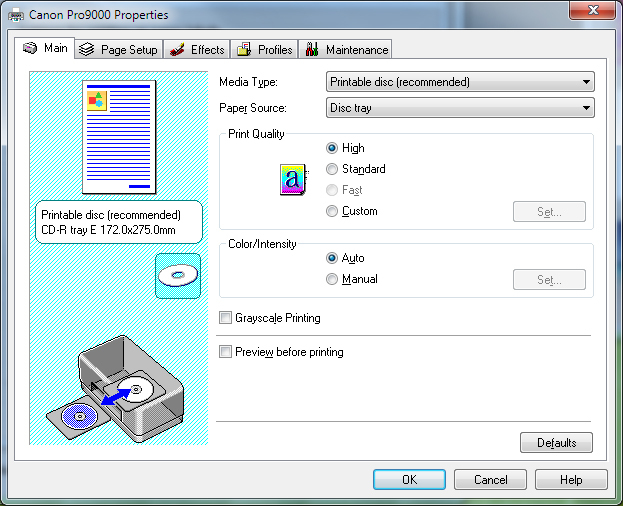 Do you have the exact same "Type" options as shown above in the picture of the Print Driver Properties? 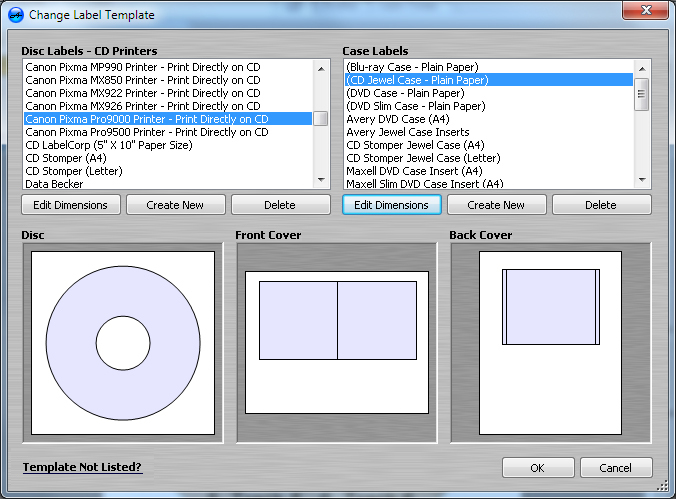 Do you have an option for the Printable disc (recommended)? I have the option for printable disc in Audiolabel. In the Canon driver I do not have printable disc as an option under media nor do I have CDR tray-E as an option under page size. From what I have learned there is a sequence that one must go through to get in the service mode to enable the European firmware in US models. Are you in Canada by any chance? Pro 9000's bought in Canada work fine without any changes. One thing I noticed is that the Disc Tray option is not available until the Printable disc (recommended) option is selected. Also the CD-R tray E option is at the bottom of the list, and can't be seen until scrolling. 1. First make sure the printer is unplugged/disconnected from the computer, and AudioLabel is closed. 2. Make sure the Canon Pro 9000 Mark II print driver is deleted from your computer. 3. Download and install the version 2.70 driver from the link on this post. 4. When installing the driver, select USA, Canada, Latin America as the Place of Residence. 5. 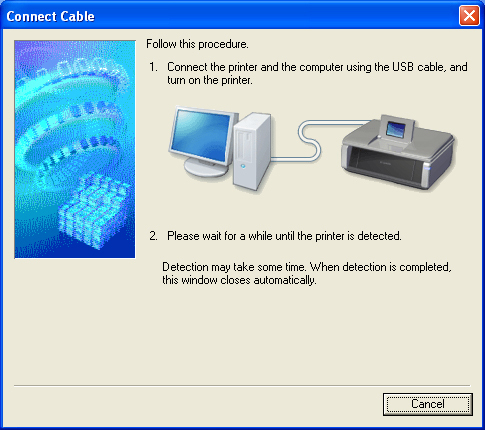 When asked to connect the printer, select Cancel (as shown below). 6. When asked to Cancel the Installation, select Yes (as shown below). Selecting Yes does not really cancel the installation. 7. After the cancel screen, there is an option to manually install. 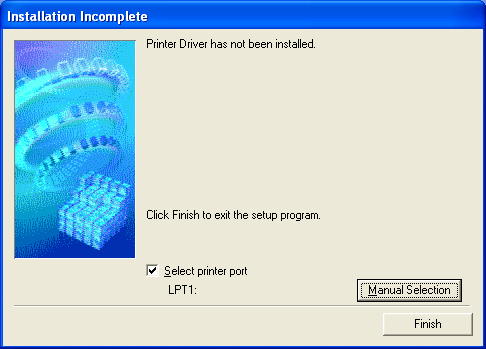 Check the Select printer port option, click the Manual Selection button, and select LPT1 as your port. When all set, click the Finish button and the print driver will install. 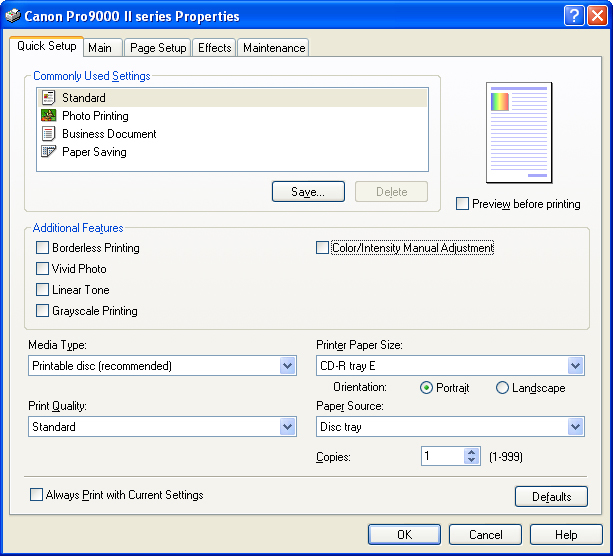 After the print driver is installed, start AudioLabel (without the printer connected) and look for the new options in the Canon print driver dialog.